Got a new vehicle - or new to you? After you put the lift on, bigger tires and rock sliders, you still have a major task ahead of you. How do you get all that stuff you want to take in the vehicle? Sure you can just make a big pile. The trick is how to organize it so it can be retrieved quickly (read that – move as little other stuff out of the way to put your hands on the item you want). And how can you store it safely and securely. Hit a big rock or flop your vehicle on the side, you want most (actually all!) of you gear to stay put. We have a RULE: The more difficult and more remote the trip the more stuff you need to take. For a day trip to the local mountains, you may only need to throw in a cooler and a warm jacket. Your buddy can run into town and bring back tools and parts. 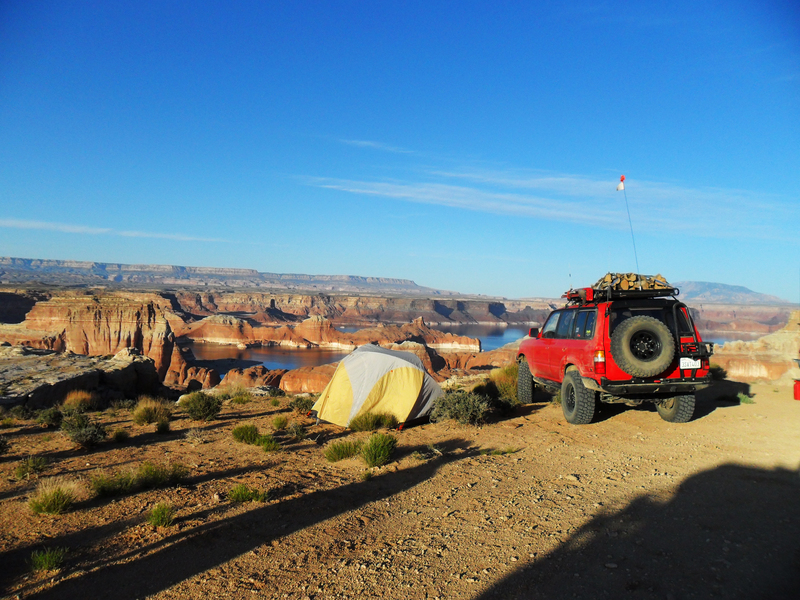 For a longer camping trip or a difficult trip like the Rubicon, you need a lot of gear. 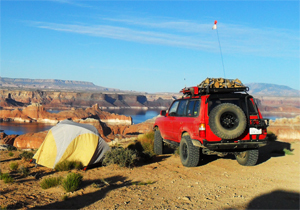 Speaking of gear, we can have an impressive array of items to fit in if we plan to be self-sufficient, prepared for the abuse and risk to our vehicle; and be comfortable doing it. I suspect this is not even close to a complete list: Mechanic tools Winch kit Other Recovery items Spare parts and fluids, Camping gear Food and food preparation Cooler or refrigerator First Aid kit Fire Extinguisher Fire wood Comfort Camping stuff – shower, tent heater, and table Clothes Extra fuel & Water Radios, GPS, maps Sports equipment Despite the fact that we are at the top of the food chain on available space (vs: motorcycles, mountain bikes, quads, backpackers), we can fill up the interior space very quickly. The problem quickly multiplies if you plan to bring someone else along. Seems they want to bring their own bag or two of stuff. You can start with a concept well known to backpackers: Pack tools and gear that are small and compact. Understand, also, that you may have to give up some comfort. For example, can you get by without a mattress? Do you really need an onboard fridge or freezer? Actually yes! Do we really want to give up anything? Well not yet. Not until, we have blown through several iterations of “storage solutions” and proven we can’t have it all. Another RULE: Anything that you can conveniently bolt on the outside of the vehicle, under the hood, or on the bumper is worth considering, because it saves space inside. Under the hood, you ask? Sure! That’s a nice spot for an air compressor. This will not only save space inside your vehicle, it will also save setup time when you need the compressor. Certain tools, parts and fluids can be stored under the hood, as well. Be mindful of the warm temperature in there. Tape, hoses, and some fluids break down in extreme heat. Just like lifts, tires, wheels, and armor there are a staggering number of options on the market from simple boxes to fully customized build in drawer systems. If you have the money, now the time is ripe to finally decide on your rear bumper system. The right one can carry many items you want to get out of the interior space. 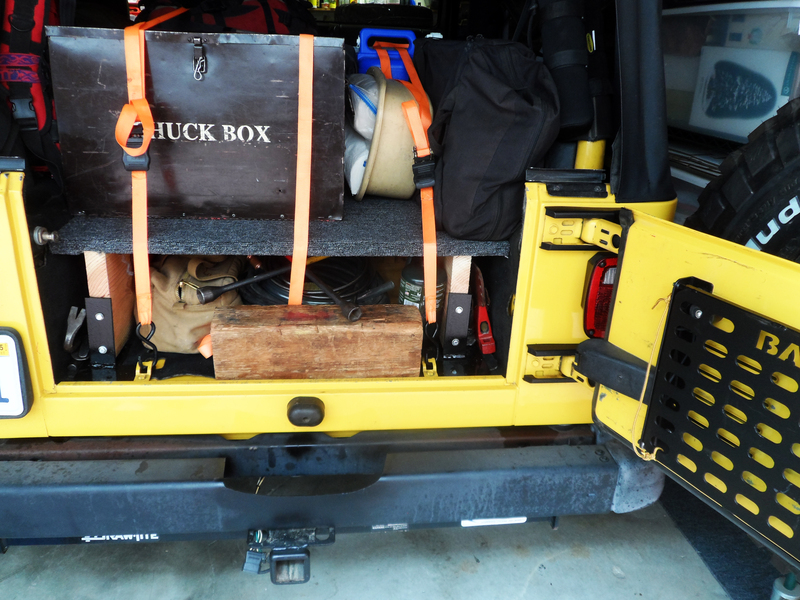 If you are not sure what you want, start with two simple items – a roof rack and a shelf. A roof rack is a pleasure to have. 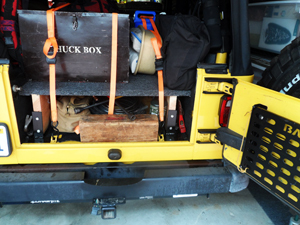 A roof rack can get bulky, odd shaped, dirty items out of your interior space. Fire grate, BBQ, spare tire, pull pal, hi-lift, gas cans, and water cans all come to mind. One drawback is that it can be difficult to lift and retrieve heavy objects. Bring a ladder. Get help if needed. I prefer to NOT put my Hi-lift jack on the roof rack. I will try anything to get my buddy to use his Hi-lift before attempting to bring mine off the roof rack. This shelf is on 2x10's. Notice the orange tie downs. Next build a shelf to divide the usable space in half. Want a simple, quick and temporary solution? Place two 2x10 (or 2x8, 2x12) boards the full length of the space (tail gate to the back of the seats) and cover it with a sheet of plywood. Find a way to attach the 2x10 to the floor and glue carpet on the plywood. Be sure and tell yourself that this is only a temporary solution. RULE: Temporary solutions tend to stick around for 5 years or more. An unbelievable number of small bags containing heavy items can be stored under the height provided by a 2x10. 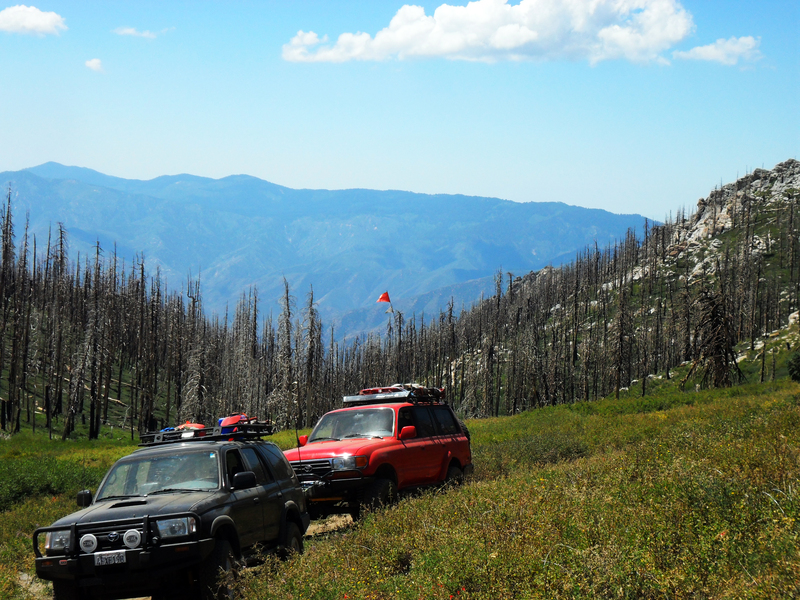 This is the ideal place for tools, recovery gear, winch kit, spare parts, spare fluids, and 16 oz. propane bottles. Organize so you can retrieve your stuff easily and quickly. For example, pack the most commonly used items within reach. Lesser used items can be buried. This arrangement helps you to set up and break camp quickly and efficiently - see our article Break Camp Quickly and Efficiently . Tie down your camping gear and other boxes on top of the shelf and you are good to go. With a bit of thought, your shelf might even work to sleep inside the truck. Provided you don’t mind leaving a pile of gear outside at night for the bears. Longer term, there are many manufacturers that offer products for purchase that are an improvement over this basic concept. The shelf will fit better, be lighter, and have trap doors or other unique ways to make use of space. They might even have built in drawers and sections that fold up and out of the way. These bags store well underneath the shelf. They are small enough to dedicate each to a specific task. The older design of military tool bags are a convenient and inexpensive way to store small heavy items – tools, D rings, chain, etc. If you can find one made out of nylon, grab several. Most I see today are cotton and only last a few years. They can be purchased in black, olive, brown, sand, and camo so you can use bag color to identify the one containing the gear you want. But use a sharpie to label them. For a bit more investment you can buy almost any size and style of bag with the “MOLLIE” attachment system. Again these come mostly in Military colors. Pelican Boxes come in all sizes. These are being used to store the camp kitchen. Boxes are a mainstay for packing. Use cardboard ones for a temporary solution. I favor cardboard, if the contents are only going to make the outbound trip with me. Once the contents are used up or distributed; I break the box down and gain space. 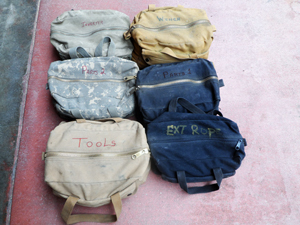 Buy Pelican boxes if you need moisture and dust protection. They can be placed on the roof or inside your vehicle. Or get the Rubbermaid Action Packer storage boxes for something more durable then cardboard. They come with handles that clamp the lid down and in sizes to match any need. Build your own wooden boxes that meet your needs. You can buy custom boxes that provide security in addition to a sliding drawer -like the Tuffy security drawer boxes. Be careful if you go to the Tuffy site - they have a lot of cool items. There are quite a few solutions for a “grub” or “chuck box" on the market also. As a RULE, I find it takes 3 trips to find the best way to pack my gear with any new storage solution. Each time I break camp and repack, I discover a better way to fit it all in. In fact, I get efficient enough to add more gear next time. My friend Montego made a suggestion many years ago. He said: on that day everything fits perfectly take a picture. Take a picture from the tail gate as packed. Unpack the first layer and take another picture. Unpack the next layer & take a picture. Now you have a record to recreate the perfect pack every time. Your 4WD vehicle is more than just a vehicle. It is in fact one big storage bin. Like traditional storage containers, it has limitations. But it also has one distinct advantage: it can hold items on the outside. With proper planning, you can maximize the amount of gear you take, yet still manage all those supplies in a fast and efficient manner.